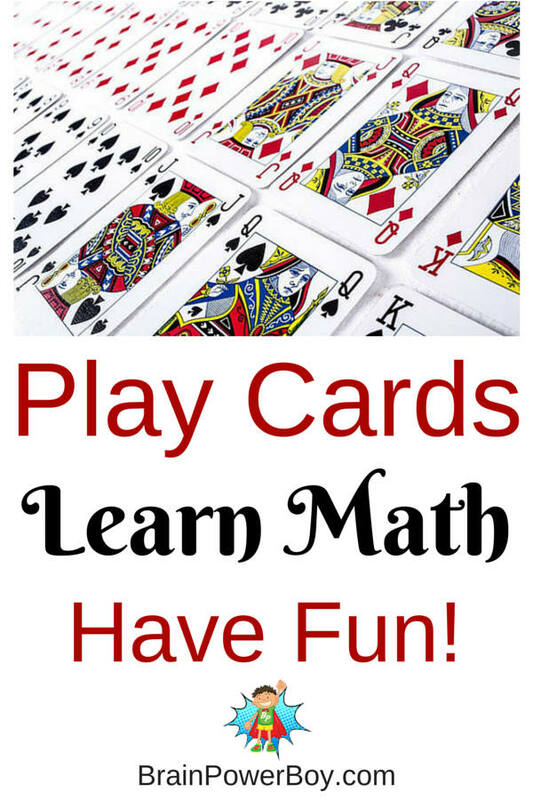 Play Cards, Learn Math, Have Fun! Play Cards. Learn Math. Have Fun! Here are some math card games that will help your kids learn math–and they are fun! A deck of cards and/or some card games easily become math games that kids will enjoy. Math seems to be an issue for a lot of people. Yet, we need to be able to use math in our everyday life and some of the best jobs require advanced math. Playing games is a great way to learn some math in a natural way. Check out these really fun math games to see if you find something you have not played in a while or something you would like to try. This post may contain affiliate links which means I may receive a small commission, at no cost to you, if you make a purchase through a link. All opinions are my own and I never recommend things unless I think they are great for boys. Thanks for your support! We enjoy playing games at our house. Playing card games kind of goes in streaks. For a while we are not playing cards at all and then suddenly we are playing several games every day. For boys who are into math they can check out the mathematical analysis of several games below. Rat-A-Tat-Cat is a basic math card game where you try to get the lowest score. Strategy and probability in a simple way are parts of this game. The cards are cool looking designs with cats and rats. A fun, quick game that is portable. For all ages. 7 Ate 9 is fast paced math and a lot of fun for elementary aged kids +. The focus is on quick calculations. If your boy doesn’t like to do math under pressure you can just change up the game or skip it and try another one instead. This game is easy to learn and only lasts 5 min or so. This can be a great one to take along on appointments or vacations. Blink is a matching game with a twist. You match shapes, number count or color. We have really enjoy it. Young kids will get a bit of mathematical practice here with shapes and matching. You have to play quick and think fast. You don’t take turns and everyone plays as quickly as they can to empty their hand. Set is another visual perceptual style game. You have to get 3 cards that must match in some way. You try to find characteristics/patterns of the cards that go together. This is a step up from a game like Blink which is much easier for younger players, plus there is also a SET Jr. Everyone plays at once and things can get a bit wild. Older boys might enjoy this SET analysis. Cribbage is a classic mathematics and strategy game. I wasn’t sure if I should put it under card games or board games, but in the end decided that the cards were what made this game and the board was only for scoring so I put it here. I grew up playing this game with my dad and brothers. I lost a lot (LOL) but it makes for nice memories. We had fun and learned math. It is played with a standard deck of cards. My dad made me a board that I love. Here are some directions in case your boy wants to give it a try. A short but interesting article on math and cribbage can be found on Wolfram Math World. Uno . Most everyone I know has this one. There are so many different types of Uno games now that it is hard to keep track. I like the older decks best that have the words instead of all of the arrows etc. See if you can find it–try thrift shops or rummage sales. Color and number matching and scoring is really the only math involved but that goes to show that math is everywhere and most games have some mathematical thinking involved. See this downloadable full text analysis on UNO from MIT. A deck of cards (we love bicycle brand ) is your best bet ever for a bit of learning while playing games. Try these links to see if there are some games that you will all enjoy. Here are three simple math games played with only a deck of standard playing cards. A few different games that your boys might enjoy including Make 10, Addition Quick Draw, Guess My Number, and more. A whole big math card game pdf Acing Math One Deck at a Time. Some of the games in here seem fun but others are just math work in disguise. As some of you know, I am not a fan of b.o.r.i.n.g. educational games. The game has to be enjoyable or we are not playing it. Just messing around with playing cards allows for a natural learning experience. We are rather fond of War, and Cribbage, and I played Canasta throughout my life and it is my all-time favorite card game. Playing games is a great family activity and I hope you will add some of these math card games to your family game night. For more games ideas take a look at the article we wrote on great games to play for math that includes great classic board games to use for math and mathematical analysis of several games. Remember that the reason to play games is to have fun–learning a bit of math along the way is a bonus. Break out the cards tonight and deal out some fun. 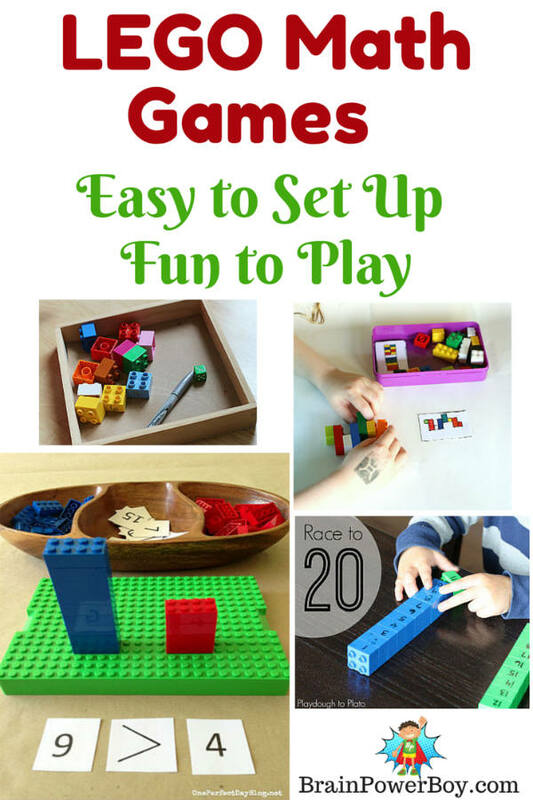 Try LEGO Math Games for more ideas. With a couple visits with family this summer, my children have fallen in love with cards. They are young, but number recognition and social games have been a huge hit with them. Thank you so much for some awesome ideas I know they will love! Gabi, Aren’t they great. I really like them as well and was grateful George let me share them on my site. Thanks for putting on FB! Thanks for linking up with the Laugh and Learn linky! Sheila, I always enjoy your posts! Recently we’ve been playing more cards with m 4 year old. My son is already a pro and recently my daughter has gotten an interest and knows enough now to be able to play along with her older brother! The hot game with my daughter right now is war. She knows which number is higher or lower but I will throw in comments like, “how come you won that hand?” And either her or I will say because 10 is higher than 4. Card games are definitely a fun way to learn math! That is so sweet of you to say–thanks as your opinion means a lot. I cannot tell you how many games of War I played with my son! Must be a popular one. I do love games for learning too. We are very much hands-on learners in our home. I even teach better this way. We use a lot of cards for learning and practicing math. There are some great games listed here. One of our kids favorites is also War. A timeless classic really.